Join our USTCP Development Team to learn more about how U.S. Tax Court Rule of Practice and Procedure 200 is an opportunity for YOU to advance YOUR tax career as a United States Tax Court Practitioner counsel Admitted To Practice Before Tax Court with the requisite knowledge and qualifications to provide competent representation of taxpayers before the Court. This FREE 1 CPE/CE online class gives you the opportunity to learn how to earn the recognized credential that enables you to provide taxpayer advisement and litigation services that you could not already do as a licensed Certified Public Accountant or Enrolled Agent. Tax Court, unlike the Internal Revenue Service, does not recognize Powers of Attorney. During this class session, you will experience a portion of the learning content presented in the first lesson of the 12 Month Online Classes Study Program. Explore, plan, and make the decision to enhance your taxation knowledge and expand your taxation career by taking the 2020 U.S. Tax Court Non-Attorney Written Examination to be administered by Tax Court in Washington, DC in November 2020 to become admitted to the U.S. Tax Court Bar. Explain and Describe the provisions of federal tax law specified in U.S. Tax Court Rule of Practice and Procedure 200. Explain the key benefits in taxpayer advisement and tax controversy representation derived from these federal tax law provisions. Interpret and Understand the U.S. Tax Court limitations and requirements for case petition filing, including who can advise, sign and file a petition to the U.S. Tax Court. Analyze the opportunities and benefits for your tax career advancement as a USTCP Admitted To Practice Before U.S. Tax Court. Identify resources available to obtain additional information about the Court. Determine whether this career advancement opportunity in federal tax law fits the direction of your intended career path in taxpayer advisement, tax controversy representation, and litigation. The USTCP Development Team is comprised of USTCP counsels with extensive knowledge and expertise in resolving tax controversy cases. These USTCP counsels also have a passion for assisting fellow tax professionals in their efforts to advance their tax careers. Each USTCP Development Team member dedicates substantial time and effort to program advancement, updates, and sharing both information and capabilities with tax professionals across the country. The USTCP Development Team proudly announced Regina’s election as the lead USTCP Classes instructor based upon her immense knowledge of tax law and tax controversy representations during the past 30+ years of her tax career, as it applies to both individuals and business taxation, as well as her strong passion for sharing career advancement knowledge and opportunities with other tax professionals. 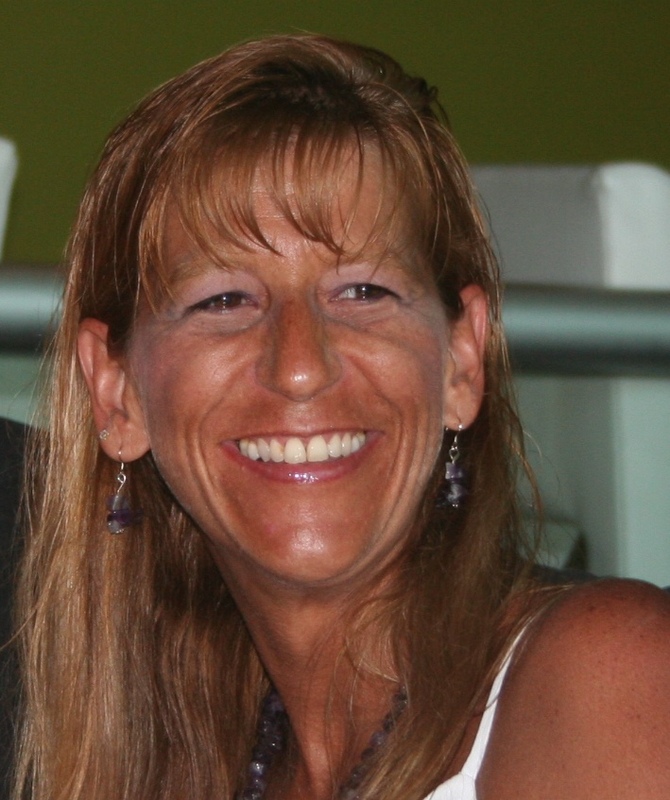 Regina shares the commitment and diligent dedication to learning the applicable rules and case management procedures necessary to portray to the U.S. Tax Court an examination candidate’s requisite knowledge and qualifications to provide competent representation before their Court. Today begins the Tomorrow of your tax career! 11:00am EST, 10:00am CST, 9:00am MST, 8:00am PST. If these sessions are full or do not work for your schedule, watch for future sessions additions! To receive 1 CPE/CE credit and Certificate of Completion the attendee must attend and participate in the online live group internet-based webinar session for at least 50 minutes from the start of the lesson program while logged in to the online class session using the same email address used for the registration. CPE/CE credits and Certificates of Completion are not available for multiple attendees. Each attendee must register separately. A Certificate of Completion will be sent by email to the same email address used for registration approximately three weeks after the online class session. Enrolled Agents or other tax return preparers attending for Continuing Education credit must register and provide their full first name, full last name, telephone number, email address, and 8-digit PTIN as shown on their PTIN card or letter. Qualifying Enrolled Agents or other tax return preparer attendee’s Continuing Education credit earned will be reported to the IRS. If an attendee does not have or provide a PTIN at registration, then only a Certification of Completion will be emailed. CE credit will not be reported to the IRS. Certified Public Accountant attendees will receive a Certificate of Completion by email and may receive Continuing Education credit if the course lesson meets their State board of accountancy, organization or other state department’s CPE requirements. Separate reporting of CPE credits earned is required. CPE/CE credit and Certificate of Completion is valid for attendance and participation in only one Free webinar session. Attendees cannot register for multiple Free webinar sessions. Tax Court will announce the date, time and Washington, DC Location of the upcoming 2020 U.S. Tax Court Non-Attorney Written Examination for admission to practice before the U.S. Tax Court by Press Release in May 2019. Use this substantial opportunity to significantly advance YOUR Tax Professional Career! Enrollment is limited and closes when classes are full. Reserve your spot today, classes fill up quickly. 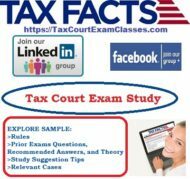 Content rich eBook Study Guides and Prior Years Tax Court Exams Questions, Recommended Answers and Theory will enhance your self study experience. The USTCP Development Team shares sample rules, prior years exams questions, recommended answers and theory for the answers along with various study tips suggestions and relevant cases for tax professionals thinking about engaging in more intensive studies in preparation to take the Tax Court Exam. Login to Your FB, Click on the link above, Like and Follow! Login to Your LI, Click on the link above, Click Ask to Join! Join our newsletter list to receive email updates and information on the Tax Court Exam Classes and Self Study Programs. Our Passion Is Helping You! What's included in the USTCP Online Study Course? Copyright © 2019 Tax Facts, a division of RR Financial Consulting. All Rights Reserved.